question asked: Sep 29 '15, 2:31 a.m.
last updated: Oct 12 '15, 8:09 a.m.
Can we calculate effort spent/in hrs on each state against a custom workitem in JRS? Is RRDI officially dead? And will Rational Insight support configuration-enabled projects? 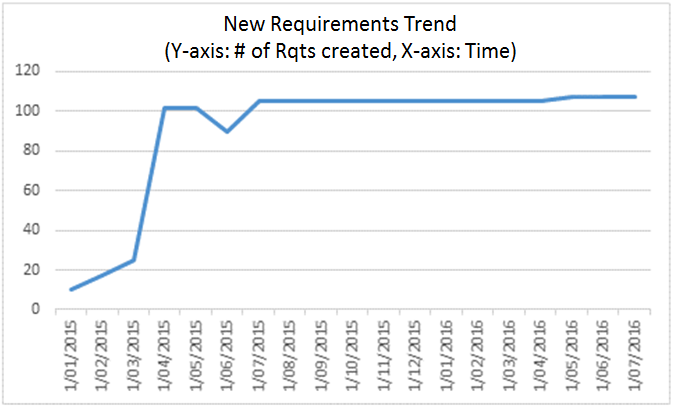 Christophe Lucas (862●41●43) | asked Sep 29 '15, 2:31 a.m.
Is it possible to create a Trend report that shows the number of DNG Requirements (Y-axis) created over time (X-axis) ? Should JRS be used, or else ? 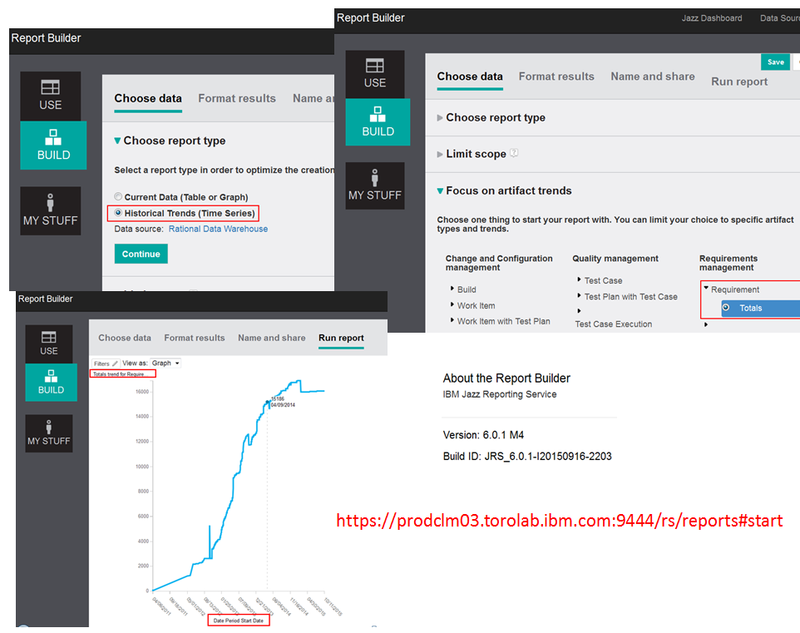 Francesco Chiossi (5.7k●1●7●19) | answered Sep 29 '15, 4:07 a.m.
edited Sep 29 '15, 4:08 a.m.
JRS / Report Builder does not currently supports building reports on trending data, so you might need to wait for a future release to accomplish that. With RRDI or Insight you can build those kinds or reports, however, unless you already have them as part of your deployment, it might be wiser to wait for JRS to implement the needed capabilities as this is the preferred reporting solution for CLM. Christophe Lucas commented Oct 12 '15, 3:20 a.m. However, I just noticed using the latest Report Builder (6.0.1 M4) on jazz.net that a new 'Historical Trends (Time Series)' is available as a selection in the 'Choose report type'. I did manage to create a 'Rqts Trend' report as per picture below. Would you know when that new feature became available in JRS ? Francesco Chiossi commented Oct 12 '15, 3:36 a.m. | edited Oct 12 '15, 3:38 a.m.
this is not present in JRS 6.0 and is probably going to be introduced in JRS 6.0.1 that is currently planned for end of Q4 (Please note that this is still subject to change at any time). Christophe Lucas commented Oct 12 '15, 8:09 a.m.
Great to have that in 6.0.1 M4 already - and the report ran fast !